Spring is here, spring is here! Well technically spring arrives this coming Thursday, but I think that, given the amazing displays of blossom driven by the warm weather of the past week, we can safely say that spring is defininitely a happening thing. Already the garden is picking up. Our plants are not only starting to visibly increase in size, but their colour is absolutely glowing. Our snow peas are a case in point. The polyhouse is powering on now that we have moved it. Indeed we keep having to leave the door open during the day as the temperature can easily get up to the mid 30’s. Here are our seedlings and styrofaom tubs of potatoes, in the foreground and baby bok choy at the far end. Even though we have a large garden area I think that gardening in styrofoam boxes are a very useful adjunct to any veggie growing concern. Our potatoes are a case in point. These ones were planted several weeks ago and now they are already up and growing. We expect to harvest these in November, at least a month and a half before anything will come out of our ground potato plot. While we will not get a massive crop we did pick several kilos when we cleared out three boxes potatoes earlier in the year. Enough for several feeds for us. 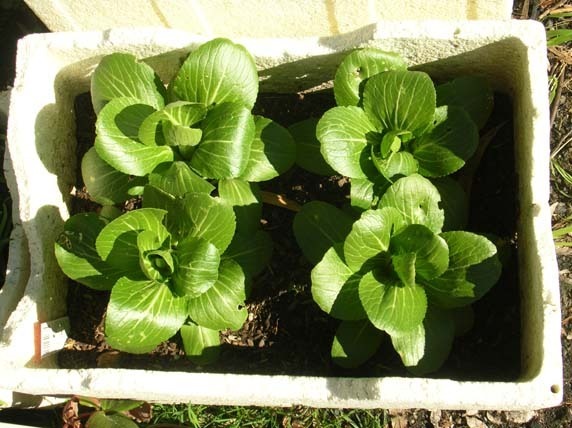 The bok choy is currently sitting outside in the sun. 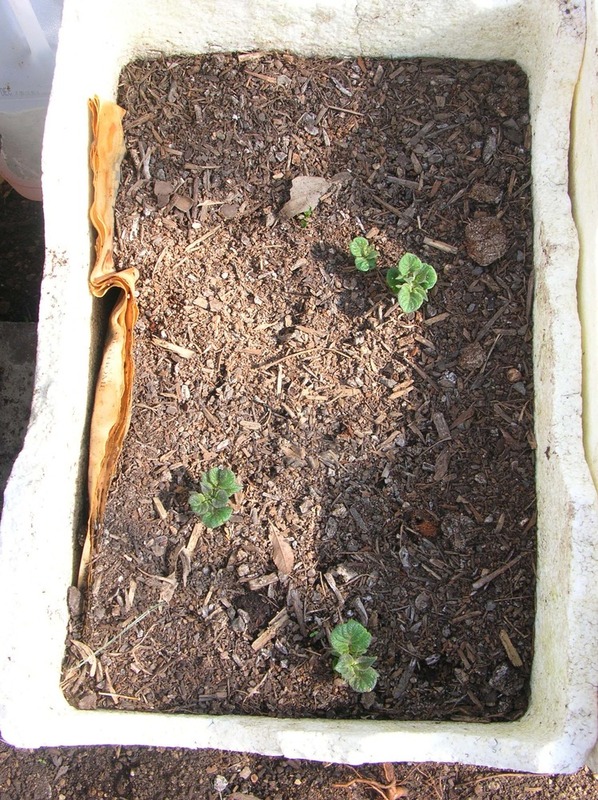 As you can see one box will readily grow four healthy plants. If you get some deep stryofoam boxes you can fill them with some decent potting mix and use them to grow herbs, lettuces, or even some of those potatoes reaching out from the bottom of your cupboard. Following our pork lunch last week, we decided to take a stroll around the gardens at Old Parliament House. Rather than visiting the very popular Senate rose gardens we visited the House of Representatives Garden, which while austere in its winter aspect of bare roses against large formal trellises was still a very pleasant place to be. Near the main entrance is the Centenary of Women’s Suffrage Fountain. It’s worth taking your time to admire the fountain proper as the water jets fire in a sequence along the fountain, first individually and then in concert. 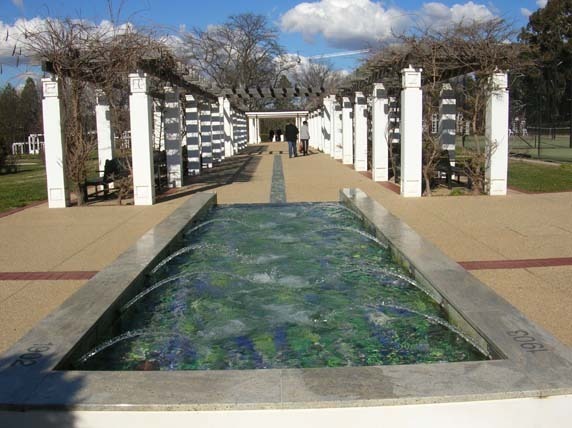 The intense colours of the mosaic tiles laid by Mary Stuart (no not that one) – the purple green and white tiles representing the colours of the women’s suffrage movement (purple symbolised dignity, white purity, and green hope) on the bottom of the pool are certainly shown to great effect with the water rippling above them. Walking towrds the rose trellises I spotted this Magnolia stellata which was underplanted with Pieris japonica (Japanese Pearl Flower) which was going ‘all out’. The main attraction in the garden in this season are the hellebores which were flowering in profusion. I was also taken by some small ‘vignettes’ in the garden such as this old grass roller placed next to the open side gate. While spring and summer when the hundreds of roses are in full bloom are undoubtedly the most popular times for a visit it’s clearly well worth spending some time in these gardens at any time of the year. Last Sunday we went to – The Pig Day Out – where we heard Lee McCosker, former owner of Melanda Park (she has sold the business but the current owners continue to rear free range pork), to speak about farming free range pork on a commercial basis. McCosker, who is a strong supporter of the Humane Choice accreditation system, made a very clear distinction between farming rather than mass-producing pork. McCosker spoke about the many concerning parallels between the way pigs are currently commercially produced and the way chickens are mass produced. I was rather startled to hear that, unlike commercially raised chickens, pigs can be given both hormone and non-hormonal growth promotants, as well as anti-biotics. Equally concerning is that there is no legal definition of ‘free range’ in the pork industry. It is therefore very difficult for consumers to really know what they are getting unless they sourced their pork from farms certified by humane production organisations (who also certify the abatoirs for humane slaughter) or could visit the relevant farm and see for themselves. Her best guide – if you are looking on the internet is to see whether photographs showed pigs at all stages of development out in the fields or just sows and piglets. If there are only sows and piglets you might be looking at what is called ‘born free range’ where the sows give birth outside and piglets stay with them for the first month, until the piglets are moved indoors for intensive rearing. Not that we were having any of that type of pork on the day. As a person trying to produce a commercially viable animal McCosker crossed the commercial white pigs used in intensive farming with rare breed pigs to produce an animal with sufficient hybrid vigour to grow well and which also retained its ‘nouse’ as a foraging animal. She must have got it right because her farm supplied a number of top end restaurants in NSW including Neil Perry’s. McCosker went on to discuss the intricacies of raising animals with the specific characteristics required by different restaurants. I would have enjoyed hearing more of this side of the story but it was time to taste the difference. We were fortunate enough to be tucking into some free range Wessex Saddleback pigs, some of which had been raised by Chef Janet Jeffs herself. 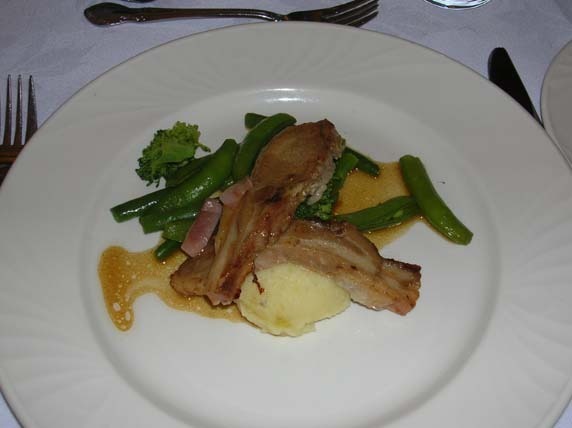 The main dish was pork marinated in Reidsdale cider and served with Ingelara potatoes and steamed winter greens. I really liked the peas which were included as part of the ‘greens’. They were only partly developed and served pod and all – both flavoursome and tender. 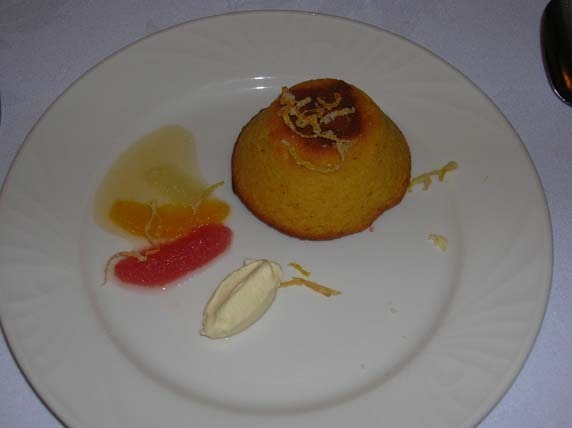 This tasty dish was followed by Claudia Roden’s flourless orange and almond cake served with orange blossom citrus and marscapone. Just some advanced notice of another interesting Kitchen Cabinet event on 30 October. People who get in early will travel to Braidwood to experience A Taste of Convict Life, A special event in association with the Crave Sydney International Food Festival 2011. We did think when we built the polyhouse last year that a position close to the house would be the best place for it to go. We had expected that the concrete underneath and the bulk of the house would provide enough thermal mass to provide some heat over the course of the cold Canberra winter nights. What we forgot was that the sun didn’t actually hit the polyhouse until mid-afternoon and even the, as you can see in the photo above, it only really hit one side of the structure. Oh well, at least the light weight construction meant that once we moved all the pots out and removed the concrete blocks holding it down it was simply a task of us picking the whole thing up and shifting it back exactly where we had made our original polytunnel! At least now we have restored our view of the garden minus a large expanse of plastic. As they say, the more things change the more they remain the same! Is this how baby carrots are made? This is the book that gave us the term ‘voted with our forks‘ so what can we say but tune in and listen. SBS is replaying the first series of Costa’s Garden Odessey on Saturdays at 5.30 pm. A great rewind for those of us who don’t get a big enough gardening ‘fix’ each week. This week I’ve also taken delivery of some seedlings from Tasmania. It is rather unusual for me to get mail order plants (as opposed to seeds), but these are something a bit out of the box. I now have 5 plants of Australian celery and I don’t mean a type of celery that has been bred in Australia, but a genuine native celery plant Apium prostratum or Sea Celery. And to add some further interest there is another native celery Apium insulare, known as the Flinders Island Celery which can also be cultivated and eaten. (The regular garden celery is Apium graveolens). I first stumbled across a reference to native celery while I was reading the Gardening Australia “Edible Garden” forum. In a general discussion on growing celery someone mentioned they’d grown the Flinders Island celery for several years and it had proved a hardy plant which tasted more or less like the common garden variety. My interest was piqued and a quick check of the Australian Plant Name Index revealed a second edible Apium, the Sea Celery. The nursery mentioned in the forum as supplying the Flinders Island celery plants turned out to be currently out of action. Thankfully a quick whirl of the interweb identified another supplier in Tassie who were growing the Sea Celery. Having contacted the suppliers TasWild Plants, I was relieved to hear that they had plants available of the Sea Celery, which grows naturally on their property. Where they live regularly drops down to – 8 over winter so there should be no problems of with the plants coping with a Canberra winter. The plants of Apium prostratum are perennial and form a mat up to 50cms high and about a metre across. I did have a small sample of the leaves and there is a distinct celery flavour with a touch of parsley thrown in as well. The parsley flvour shouldn’t be too much as a surprise as both celery and parsley come from the same Family Apiaceae, although parsley Petroselenium crispum, is in a different genus. I’m really pleased to add this plant to my garden as its another step towards increasing the number of native plants that I grow for regular eating. This week’s sudden burst of warm weather has certainly sent everyone into a tis – and at Chez Fork we have been enjoying the pleasant weather in the garden. Even though we know that the cold weather will return we haven’t been able to stem that first sniff of spring rush of blood to the head. 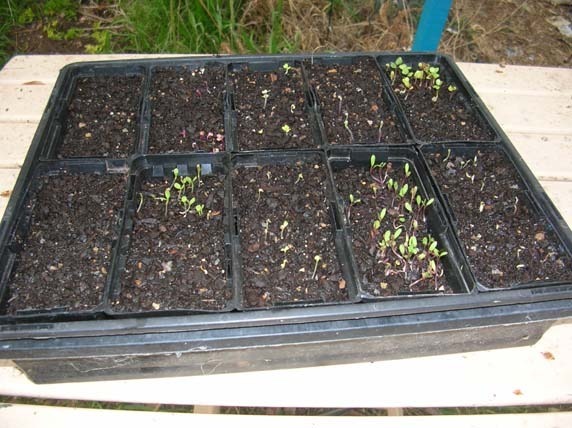 We’ve been really feeling the lack of salad greens lately as some of the seedlings we planted in autumn have just sat there without putting on enough leaves for us to pick.TB has set up a tray of seeds on the heaterpad. Not suprisingly within 2-3 days most of the seeds had germinated. First out of the pots were the wrinkled cress (see picture below) and cos lettuce, closely followed by the chicory and buttercrunch lettuce. The Siberian tomatoes have also sprouted, but if my memory serves me correctly we did the same last year and the plants stalled as seedlings at about 3cms high. Speaking of tomatoes one of my siblings, who lives in slightly friendlier climes in the Hunter Valley, tells me that they have just picked the last tomatoes from their bushes. I’m pleased to say that the bushes were grown from seed that came from my favourite “Front Yard Tomato” last year.